What Factors Determine the Carrying Capacity of an Ecosystem? Carrying capacity, or the maximum number of individuals that an environment can sustain over time without destroying or degrading the environment, is determined by a few key factors: food availability, water, and space. These key factors have the ability to limit, or even reduce a population by lowering birth rates, increasing the death rate, or encouraging migration. For this reason, these are referred to as ‘limiting factors.’ When there are no limiting factors a population can grow exponentially. These limiting factors can be further broken down into abiotic or biotic limiting factors. Abiotic factors are non-living physical and chemical elements in the ecosystem, such as sunlight, temperature, soil, water, and oxygen. Biotic factors are living or once-living organisms in the ecosystem, such as food, disease, competition, and predators. 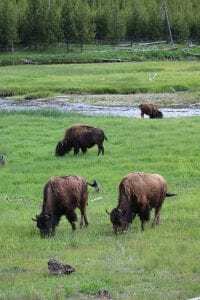 As an example, we can look at bison in Yellowstone National Park. They have to compete with elk and other ungulates while foraging for food, a biotic factor. One abiotic factor limiting bison is the weather, as heavy winter snows can drive them out of the park. We can also look at factors that determine carrying capacity in terms of their density-dependence. Density-dependent limiting factors make the per capita growth rate decrease as the population increases. Density-dependent limiting factors tend to be biotic, including factors such as food and disease. For example, in a population of panthers, there is access to a fixed amount of food. When the population remains small there will be plenty of food for all panthers. When the panther population gets large enough the food may become insufficient, leading to competition among panthers, from this competition, panthers may starve, or die, and stop reproducing. 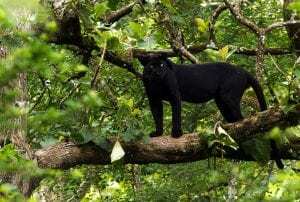 As such, the per capita growth rate of the panther population may shrink or level off. Food in this case is an example of a density-dependent limiting factor. Density-independent limiting factors are factors that affect the per capita growth rate regardless of how dense a population is and include factors such as a flood, drought, and habitat destruction. Consider a flash flood occurs in the panther habitat. The flood has the ability to kill any panther that is in the wrong place at the wrong time, independent of how many panthers are in the area. In this case, the flood, or natural disaster, is the density-independent limiting factor. While food and water supply, habitat space, and competition with other species are some of the limiting factors affecting the carrying capacity of a given environment, in human populations, other variables such as sanitation, diseases, and medical care are also at play. Often, some variables are not equitably distributed among human populations with some consuming more than others, and with affluence on the rise globally, human carrying capacity is neither static nor easy to calculate. Help your students understand carrying capacity by sharing the activity Panther Hunt where acting as panthers, students compete for limited “prey” resources in the classroom “environment.” Or, Habitat Scramble where students act as individuals of species in a habitat trying to survive by collecting cards that represent essential habitat resources and explore what happens when a habitat is disrupted. NGSS Lesson Plan for Middle School – How Much Space Do We Need?